Hungry and traveling on Rt 91 near Greenfield, MA? If so, swing through town for a bite to eat at Hope and Olive. 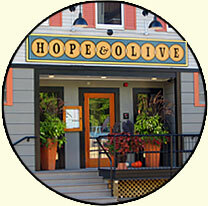 We had a little trouble finding it, so look carefully for Hope street! From the highway, head for the center of Greenfield and continue straight through three sets of lights, then take the first right after the movie theater onto Hope Street. Next corner is Olive Street. A little bit off the beaten track, but well worth it. Though it would not be difficult to run up a big tab, and linger long, a great bar menu makes it both a reasonably priced and a quick pit-stop with excellent value, friendly service, fun atmosphere and ultra-delicious food. Give it a try!